"No. 4 represents a diamond which I bought at Ahmadabad for one of my friends. It weighed 178 ratis, or 157½ of our carats...[no. 5] represents the shape of the above mentioned diamond after it had been cut on both sides. Its weight was then 94½ carats. The flat side, where there are two flaws at the base, was thin as a sheet of thick paper. When I had the stone cut I had this thin portion removed, together with a part of the point above, where a small speck of the flaw still remains." This is the only instance of Tavernier supplying drawings of both rough and polished forms of a diamond. The briolette-shaped diamond was presumably cut in Ahmadabad: after that its history is uncertain. Who was the friend Tavernier purchased the diamond for? The most likely person was his sovereign, Louis XIV of France, to whom he had sold several diamonds, among them two briolettes. But there was never any reference to a diamond such as the Ahmadabad entering the Crown Jewels of France. Others, including Edwin Streeter, the author of two books on famous diamonds, have indicated that the diamond may have found its way to Persia via one of the numerous ports of Gujarat which served as a gateway to the Persian Gulf and Arabia, but no trace of it has been found among the Iranian Crown Jewels. A 'friend' is an unlikely epithet to the mighty Aurengzeb, the last of the Mogul emperors (1659-1707) and a noted collector of diamonds, of which one is reputed to have been the Ahmadabad. It is more likely that the 'friend' was one of the emperor's courtiers, who would have bought the gem for the emperor. The Ahmadabad is next reported to have belonged to the Begum, Hazrat Mahal, the wife King Wajid Ali Shah of Oudh, who had been exiled to Calcutta by the British after his refusal to sign a treaty of abdication at the time of the Indian Mutiny of 1857. She was a beautiful woman and an outspoken rebel leader at the time of the Mutiny. When British forces regained control after the rebellion, she fleed to Nepal where, it is said, she traded the diamond in return for her safe passage. It is unlikely that the Ahmadabad Diamond has completely disappeared. It should be noted that its weight is lighter than that of the recorded weight of 90.5 carats of the Ahmadabad; however, such a drop in weight might be explained by its transformation from a briolette to a pear shape. But of greater significance is the fact that this gem possesses a minor flaw at its base, at the culet facet. Is it not probable that this is one of the two small specks of flaw which Tavernier stated had remained after the cutting had taken place? Therefore, it is possible that this diamond, besides possessing a notable beauty found in the finest diamonds from the historic Golconda mines of India, is also a long-lost gem. (A gemologist friend of mine believes there is no way that one could cut a 90-carat briolette into a 70-carat brilliant pear. He thinks this story is just one that has been made up by the auction house to make the stone more interesting. "Judging by the style of the cut," he writes, "I’d say it was cut around the early 20th century. It’s therefore quite likely be an African stone (the Premier mine is known to have produced 'Golconda-type' stones.)" The Ahmadabad has been graded by the GIA as D-color, VS1 clarity and was accompanied by a working diagram indicating that the clarity is improvable. 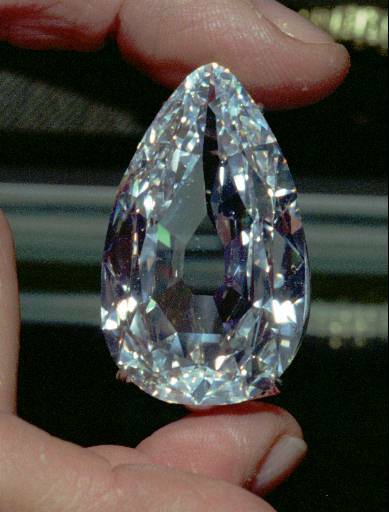 The gem is an antique pear-shaped brilliant and its weight is 78.86 carats. I have not seen its GIA certificate but I would wager its culet was graded as Extremely Large, as can be seen in the photo above. I am guessing the gem was was more of a double-sided rose cut originally, with a pear-shaped outline, essentially a somewhat flattened briolette. Also, the pavilion mains are horizontally split, a cutting step visible in the above photo. The gem came up for sale at Christie's in Geneva in November of 1995 when it was bought by Robert Mouawad for $4,324,554. Sources: Famous Diamonds by Ian Balfour, Travels in India by Jean Baptiste Tavernier (translated into English by Valentine Ball), and various internet/magazine articles.